That’s one automobile event I’d love to see. The web site calls it “The World’s Longest Running Motoring Event.” First run in 1896 (120 years ago) to celebrate the passing of the Locomotives on the Highway Act, which upped the speed limit for “light locomotives” from 4 mph to 14, and dropped the requirement that they be preceded by a man carrying a red flag, it’s been run off and on ever since, though pretty much annually since 1927. But it’s not just the age of the event that appeals to me, it’s the fact that only cars built before 1905 are allowed to participate. 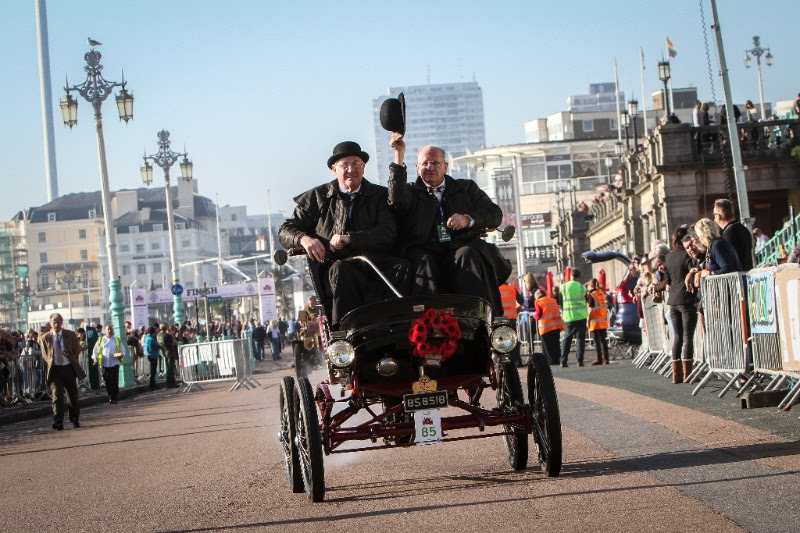 This year, they’re expecting 426 veteran cars for the 7 am Hyde Park start on the 60 mile run. Among them will be 14 steam powered vehicles and two electric ones. There’s apparently a movie about the run, called Genevieve, and the 1904 Darracqu from that film will be one of this year’s participants. For more information on the movie, check out WIKIPEDIA. I think I need to track down a copy of that to watch. 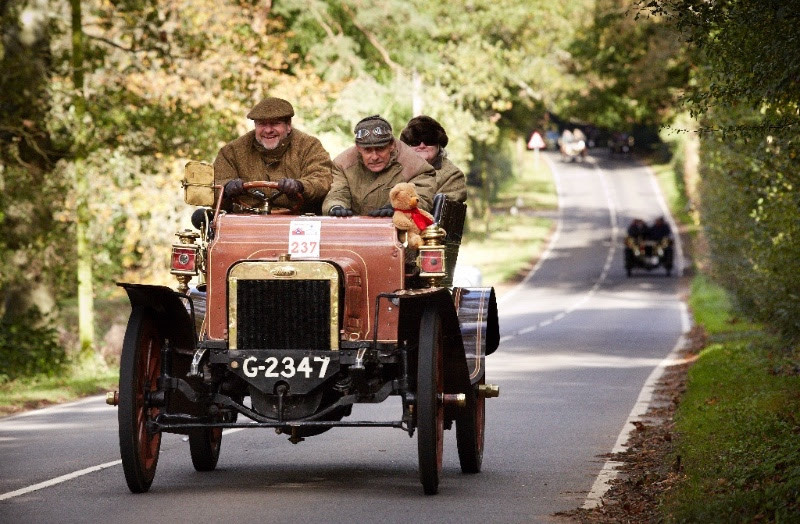 This year, the Run is also celebrating 130 years of the automobile. In 1886 Karl Benz first revealed his Patent-Motorwagen. Fourteen German-made cars will be participating in the run. 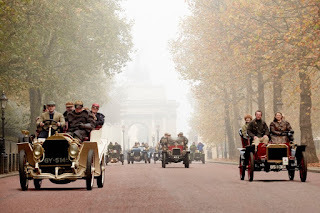 Two, an 1898 Benz Phaeton, and an 1989 Benz Victoria, have been entered by the Allgemeiner Schnauferl Club (a car club), founded in 1900. Two more, a 1902 Mercedes Simplex, and a 1901 Benz Spider, have been entered by the Mercedes-Benz Museum. That’s me in the foreground. That’s my dad’s 1964 Mini Cooper behind. Beside that is another Mini owned by friends of my parents. 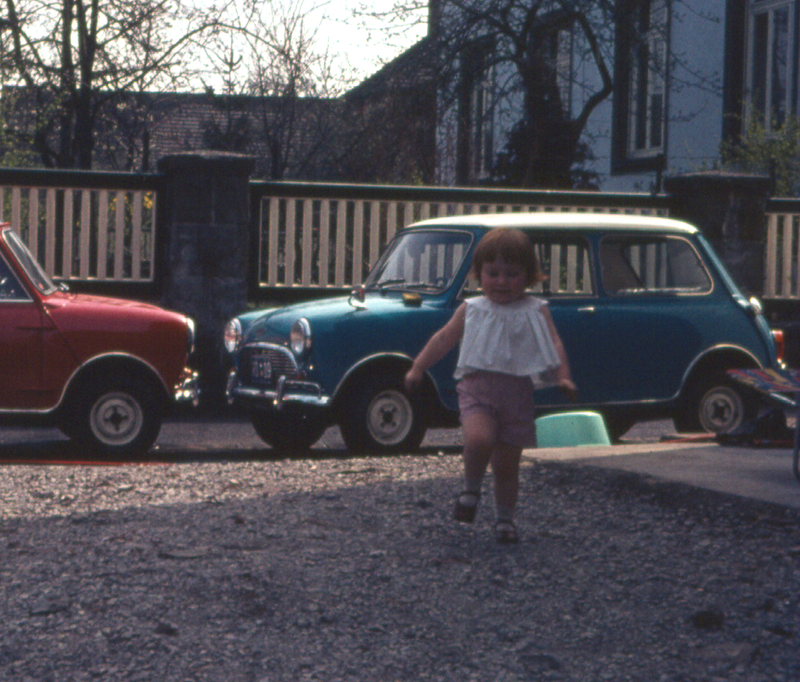 I don’t consciously remember this car, but I suspect that’s where my love affair with cars, and particularly British cars, began. Here’s a couple more photos of the Mini. 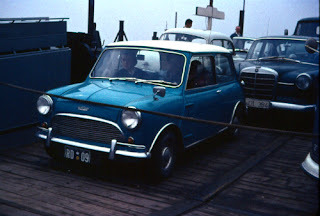 The first is on a ferry headed for northern Germany (we were living in Germany at the time). I’m assuming my parents went to England to pick the car up but it must have been the European model because the steering wheel is on the left. The second photo shows it freshly washed. Gotta admit, it is cute. 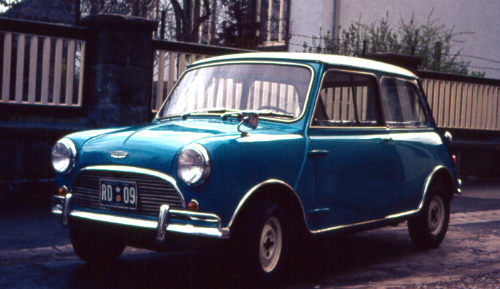 So was the Mini wagon we had later. Ever wondered what it would be like to take the wheel of a classic Austin-Healey? Check out this 360° test drive by Marc Vorgers—you have to pause the video to change the viewpoint. You can find other test drives of both classic and modern sports cars on his YouTube channel.